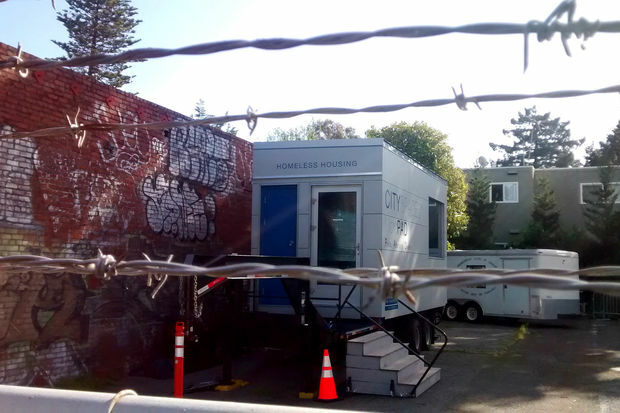 In Berkeley, Calif., "Micro Pads" have been provided to some homeless residents. CITY HALL — The first permanent tiny homes in Chicago could be built in Auburn Gresham as part of an effort by Catholic Charities to get homeless veterans off the street. Part of the Archdiocese of Chicago, Catholic Charities unveiled plans during a hearing Tuesday at City Hall designed to explore whether the hot home design trend could ease homelessness in Chicago. Catholic Charities Housing Services Vice President Eileen Higgins said the nonprofit wants to build seven homes on property it owns near 79th Street and Emerald Avenue, where it operates 141 studio apartments for formerly homeless veterans as part of St. Leo's campus. While the proposal appeared to be in the early stages, Higgins said it made sense to a launch a pilot program to test whether Chicago should follow the lead of Portland, Ore., and Berkeley, Calif., and test the volunteer-built 320-square-feet homes that cost just $2,000. Services would be available to the residents of the one-bedroom town home-style residences, Higgins said. But 17th Ward Ald. David Moore, whose ward would include the tiny homes, said he did not know anything about the plan, and would need more information before throwing his support behind it. Ald. Ed Burke (14th) has championed tiny houses as a way to get the 5,889 men, women and children who are homeless in Chicago on any given night off the street, according to the 2016 Chicago Homeless Count and Survey. "Tiny homes would be a practical means of reducing homelessness," Burke said, adding that the homes would be provided to residents free of charge, in return for routine maintenance and an agreement to follow a set of rules. Anthony Simpkins, managing deputy of the city Planning Department's housing bureau, said city officials were reviewing two proposals to build tiny homes on vacant city land. However, Simpkins told aldermen a number of issues needed to be resolved before any of the proposals would get the green light from city officials, including questions about zoning, building codes and financing. Ald. Walter Burnett (27th) said he would welcome a neighborhood of tiny homes in his West Side ward. "People want their own space and some dignity," Burnett said, adding that he was only able to move into a small studio apartment after a period of sleeping on friends' couches. A joint session of the City Council's Housing & Real Estate and Human Relations committee endorsed a resolution supporting the tiny home concept, which will be considered by the full Council Oct. 11.